If you watched the Super Bowl, you probably saw the Bud Light ad. 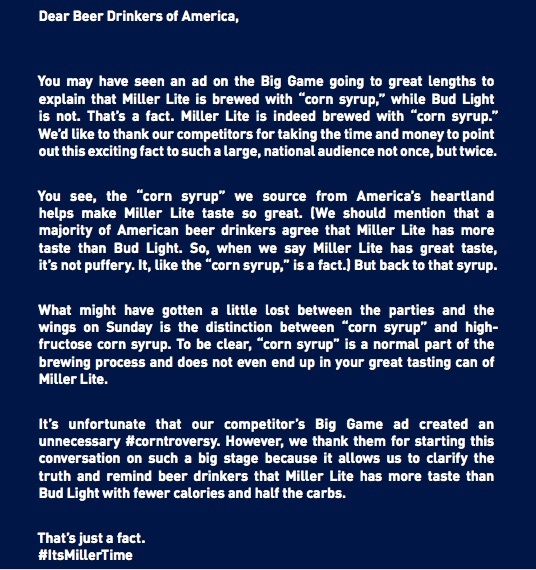 Very cleverly, creating many smiles (except from corn farmers, Miller Lite, and Coors Light), Bud Light let us know that it uses no corn syrup. And reputedly costing them $5.2 million for 30 seconds of prime time, the price was more than $10 million. The beer market has been shifting. In 2007, the two biggest companies, ABInBev and MillerCoors together had an 80% market share. In 2017, at 66%, it was shrinking. With craft beer an increasingly worrisome threat, the legacy firms have tried to sound more authentic. For Bud (owned by ABInBev), that meant no corn syrup. You can see that they assumed we associate corn syrup with the more highly processed negatively perceived high-fructose corn syrup in soda. Actually, whether a brewer uses rice (Bud Light) or corn (Miller and Coors), the intent is milder flavor and fewer calories. Also, it doesn’t hurt that corn could be a cheaper alternative. Bud Light competes as an oligopoly. Defined as huge firms that mass produce for a large number of consumers, oligopolies dominate a market. Usually they compete against fewer than eight firms and have pricing power. Mostly though, they like to differentiate their product. So yes, Bud, Miller, and Coors are behaving like typical oligopolies. My sources and more: Mother Jones was the perfect source for some beer and corn syrup insight. I just needed to add The Miami Herald and AdWeek, and I had the whole picture. Please note that some of Our Bottom Line was published in a past econlife post.